The staff was friendly. The pool area was clean and inviting. The option to rent lockers and be able to leave your luggage was nice and convenient. The bathrooms were a bit dirty and run down. The tent camping is where we stayed. I liked the tent, but it was loud and hard to relax or sleep due to noise and roosters. The bed was very uncomfortable and the linens looked quite old. It was fine for a one night stay. Maybe the actual rooms are a bit nicer. The price was good. I enjoyed lounging by the pool. 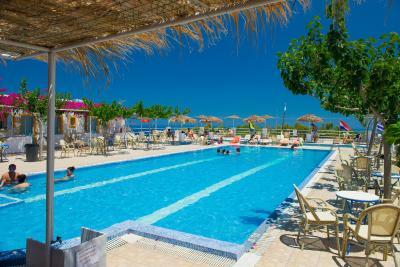 The location is very good, just 300 meters from the bus station where all busses start and finish. 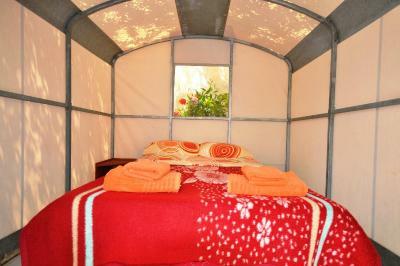 We stay in a double tent, for september is good, but If you go in summer It will be to hot in the morning. Staff was nice...boss picked on cook and cook left in disgust, i saw it all. Morally cook was right for giving sandwich to house keeper that no one claimed. 3euro big deal? 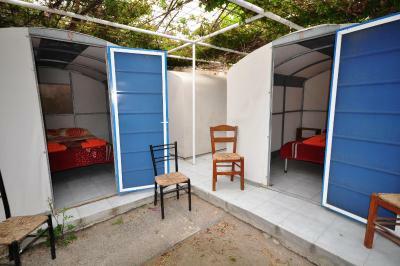 50 euro deposit, for what , nothing in my bed tent not even close to 10 euro...lol. Bar tender charged me 3.50 euro for small can ice tea...what?? This is no luxury resort. Need new owner evidently. 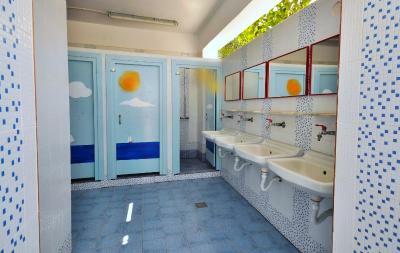 The toilets and showers were clean, staff friendly, lockers to charge electronics, towels for rent, nice bar and restaurant, nice swimming pool. Location is very good to walk everywhere and take the bus. Super friendly staff. They helped us all the time. You can pay an extra 5 euro and extend the check out time. 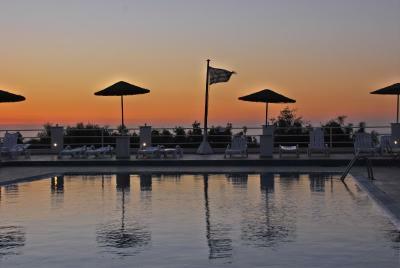 The swimming pool is the best. 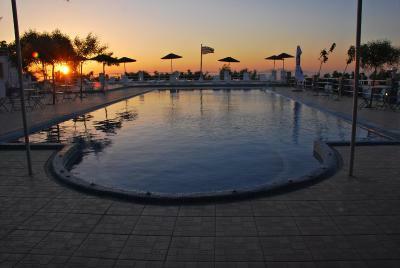 The pool was nice and the hostel is just a five minute walk from town which was great. 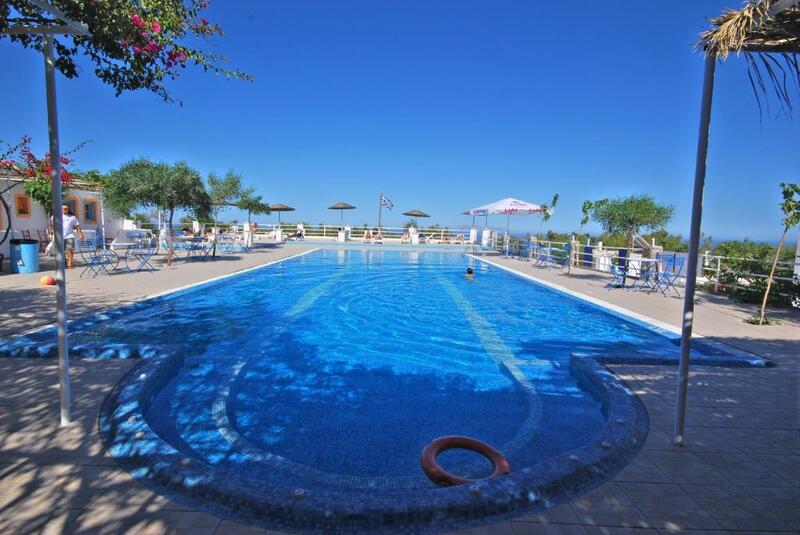 The location, the swimming pool, the price! The tend was good and their gyros souvlaki is amazing!!! For a camping, it’s quite clean! We enjoyed it lot! 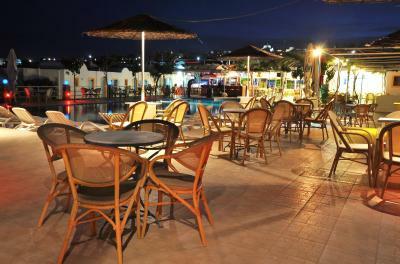 The place is near to central bus station thira. Its the cheapest you can find. 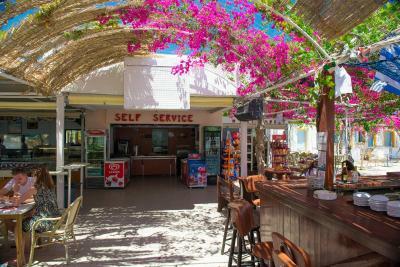 Just 1,150 feet from the center of Fira, Santorini Hostel features a pool with sun terrace, a self-service restaurant and a poolside snack bar. 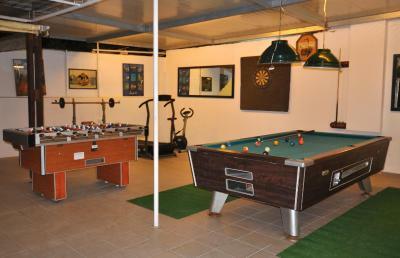 A hot tub, a fitness center and a mini market are also included. 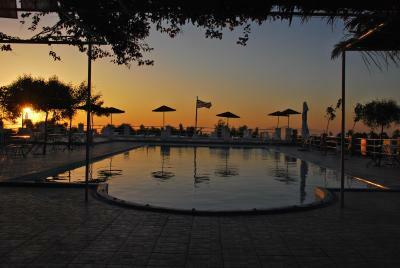 Opening to a patio, the dormitory rooms of Santorini Hostel enjoy views over the pool, the garden or the Aegean Sea. 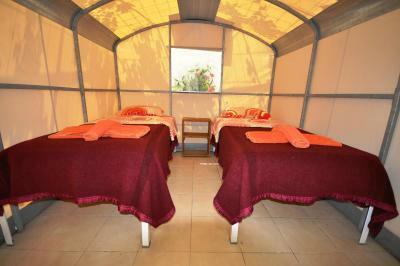 The dormitory rooms are equipped with A/C, while the tents come with a fan. 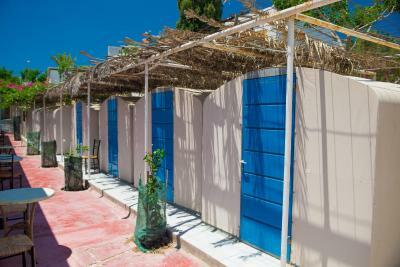 All accommodations types include a shared bathroom with shower. 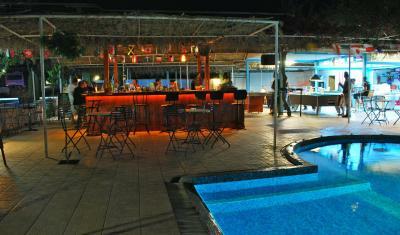 Guests can relax at the sun loungers by the pool and enjoy a refreshing drink from the poolside bar. 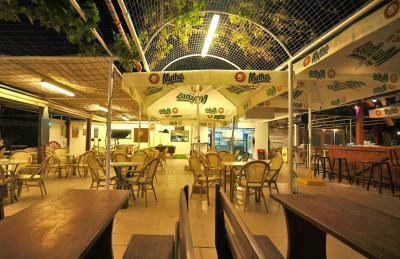 The self-service restaurant offers a variety of Mediterranean dishes for lunch or dinner. Staff at the front desk can arrange car and bicycle rental, while laundry and dry cleaning are also available at extra charge. Free WiFi is available in public areas. 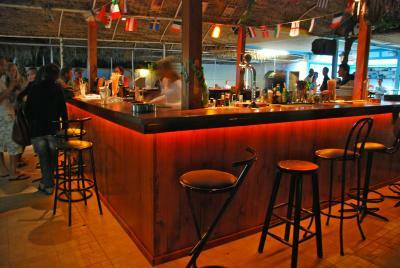 A variety of restaurants, bars and shops lies within a short walk from Santorini Hostel. Ormos Athinios Port is at 5 mi, while Santorini National Airport is 3.1 mi away. The main bus station of Fira is at a distance of 1,000 feet. Free parking is possible nearby. 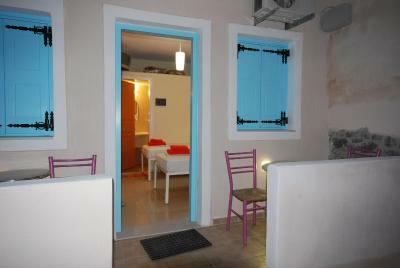 When would you like to stay at Santorini Hostel? 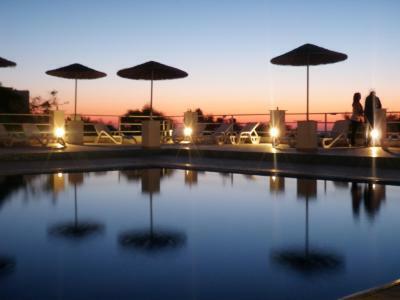 This air-conditioned room opens to a patio overlooking the pool, the garden or the Aegean Sea. 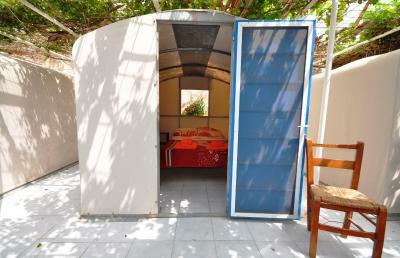 It features a fan and a shared bathroom with a shower. 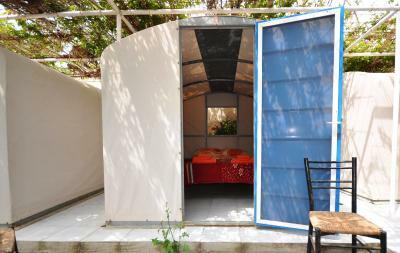 House Rules Santorini Hostel takes special requests – add in the next step! Santorini Hostel accepts these cards and reserves the right to temporarily hold an amount prior to arrival. Please note that the reception operates 24/7 until 30/9. 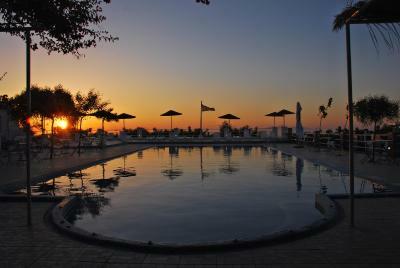 Please note that from October until April the swimming pool does not operate and breakfast is not available. The property only offers accommodations. Please note that a damage deposit of EUR 50 is required upon arrival for incidentals. The deposit is fully refundable upon check-out and subject to a damage inspection of the property. The people in the room: old man was snoring very strong. FILTHIEST BATHROOM in my traveling experience, No cleaning whatsoever. Except price. Smells, No ventilation, Door is out of control I would pay more and go to other hostel. Unfortunately the floor was always somehow wet. The bathroom has a shower in the same area as the actual toilet. Not a seperate shower so the floor was always wet and slippery. 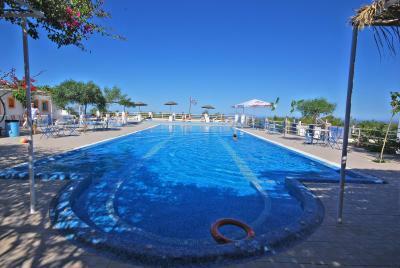 In the winter months, the swimming pool and kitchen are closed. Brilliant Location! 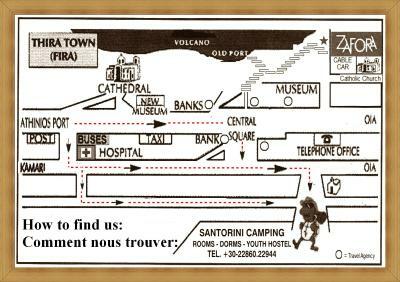 Only a 10 minute walk to the main Fira bus station. The man running the place was really friendly. He arranged airport transfer for our return flight for the two of us for 20 Euros. Also there was a plug in radiator which was absolutely great because it was freezing (this was in early March). The room(bedsheet, blanket, pillow)/bed/toilet weren't clean at all, unfortunately. The staff is really nice and friendly. 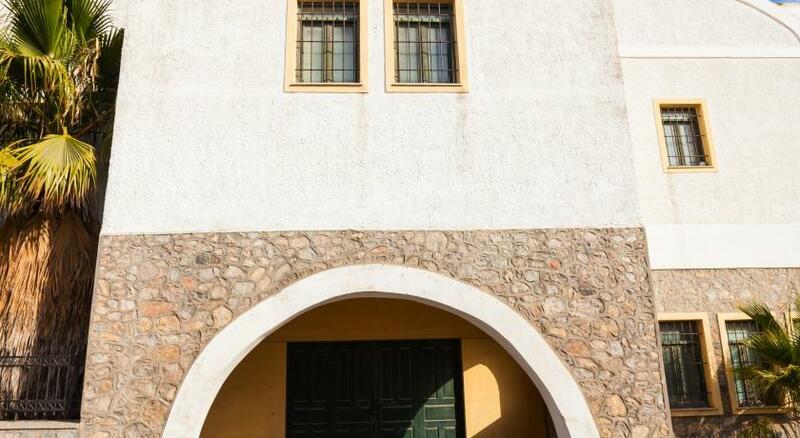 Close to Fira town centre. Super cheap. Can't complain much for this price. 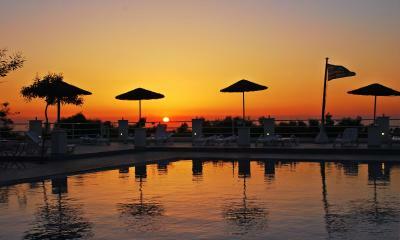 Staff bad, rooms stinky, wifi did not work far from the common areas and nor in the rooms. I understand that winter season is low season and the hostel underwent renovations, however, it was all messed up. No one was at the desk and the bathroom was dirty. The room and especially the bathrooms weren't clean at all and it was February so you can't blame the other users for their lack of consideration as the hostel was nearly empty. The wifi and cleanliness were not great...the wifi actually was the worst I’ve ever used, constantly disconnecting me. It existed I guess. It’s unclear how frequently the rooms are cleaned. People seemed to leave without the head guy noticing or removing their sheets. for future travellers: do NOT pay online, prepare cash. This is to avoid the host saying they did not receive your payment and ask you to pay twice. Beds are too small and mattresses are thin and very uncomfortable. 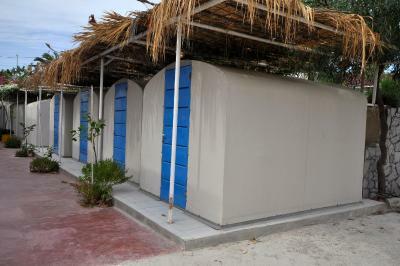 Toilets are not in good conditions. The location is very good. Just 5 minutes walking from the centre of the city. 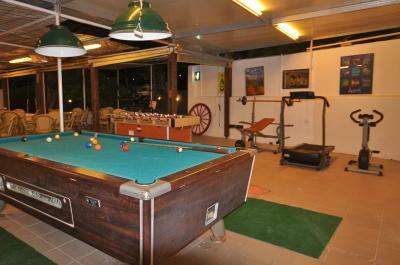 The name Santorini hostel is not seen, only saw camping area. Checking in time no Traveller info was found and were ask to proof that payment made or need to pay on the spot. The double deck “bed” is quite low at the bottom and no proper safety “feature” for those who sleep at the top. Mattress and pillow cover is really old, the pillow is flat. Mattress cover is not possible to tuck in well. Only the pool was empty but it was the end of October. It needs a bit of life breathed back into it. It felt worn out, but still with lots of potential. In the high season it looks like the hostel would be awesome. But at the end of October thy had drained the pool and packed everything up, it felt like doomsday. The room was good though and had a private bathroom between the girls I was sharing with. The wifi was not secured and didn’t work in my dorm. You needed a 50euro safety deposit which I wasn’t aware of on booking the hostel. It had two bathrooms within the 8 person dorm.